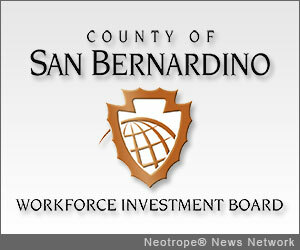 SAN BERNARDINO, Calif. /California Newswire/ — The County of San Bernardino Workforce Investment Board today announced that it is accepting applications for its 2013 youth training and employment assistance program. The program has 503 openings for youth ages 17 to 21. "As a youth provider, we are investing in the future workforce," said Russell Degnan, Executive Director for Operation New Hope. "Partnering with the Workforce Investment Board to serve these young people is rewarding today and a great benefit to our economy." Participating youth will receive mentorship, resume assistance, soft skills and vocational training, and work experience opportunities. The County of San Bernardino will provide all training and services at no cost to participants. The program begins July 1, 2013 and ends June 30, 2014. A second year of follow up services will help youth achieve goals set in the first year of the program. Thirteen local organizations will serve as youth providers, working directly with youth to build work readiness skills. These organizations include the Apple Valley Unified School District, Career Institute, Chino Valley Unified School District, Colton Redlands Yucaipa Regional Occupational Program, Family Service Association, First Institute, Gang Reduction Intervention Team, Goodwill Industries Southern California, Hesperia Unified School District, Mojave River Academy, Needles Center for Change, Operation New Hope, and the Provisional Accelerated Learning Center. "The youth employment program builds the skills necessary to find jobs in San Bernardino County's in-demand job sectors," says Sandy Harmsen, Executive Director for the County of San Bernardino Workforce Investment Board. "This reduces the skills gap, ensures our young residents will have jobs, and strengthens the economy." To qualify for the program, applicants should be ages 17 to 21 and have significant barriers to employment. "Ensuring that our young people are ready for the job market is critical to our economy's continued improvement. Of the 523 youth that completed last year's program, 77 percent continued on in education or employment," County of San Bernardino Board of Supervisors Chair and Second District Janice Rutherford said. "This means a vast majority of these young people are transitioning from receiving aid to contributing as members of the workforce." For information or to apply, contact 1 (800) 451-JOBS or visit http://www.csb-win.org/ . The Workforce Investment Board of San Bernardino County (WIB) is comprised of private business representatives and public partners appointed by the County of San Bernardino Board of Supervisors. The Workforce Investment Board strives to strengthen the skills of the County's workforce through partnerships with business, education and community-based organizations. The County of San Bernardino Board of Supervisors is committed to providing county resources, which generate jobs and investment. The Workforce Investment Board, through the County of San Bernardino's Economic Development Agency and Workforce Development Department, operates the County of San Bernardino's Employment Resource Centers (ERCs) and Business Resource Centers (BRCs). The ERCs provide individuals with job training, placement and the tools to strengthen their skills to achieve a higher quality of life. The BRCs support and provide services to the County's businesses including employee recruitment. Employers and job seekers who are interested in the Workforce Investment Board programs may call: (800) 451-JOBS or visit www.csb-win.org . Also follow us on: Facebook www.facebook.com/SBWIB ; Twitter @InlandEmpireJob; and YouTube http://www.youtube.com/SBCountyWIB .